This young, recently planted tulip tree seems to be thriving in the Panhandle. Smack in the middle of the undulating, open space that is the core feature of this linear park, it enjoys full sun and suffers little competition from the older trees that line the edges of what was designed to be a classic, nineteenth-century “greensward.” In perhaps fifty years, if all goes well, this will be a magnificent tree, standing 50-60 feet tall and spreading as much as 40 feet, with tulip-shaped, flowers in early summer and yellow fall foliage. It will also block the grand vista . . . the soul-expanding experience afforded by the long view down the center of the Panhandle. And there is a premium on sunny, open space in this park. So I wonder about the decision to plant this particular tree in this particular place, blocking the view and adding more shade. What were the criteria ? One important consideration in tree selection is the potential for a tree to thrive in a given location (soil type, amount of sun, competition from nearby trees, appropriate irrigation, etc.). But so many other considerations must come into play in a park like this; for example, is there historic precedent for tulip trees in this park? And when new trees are planted here, how are historic precedents weighed against potentially conflicting goals, like making the park more sustainable into the future? Is there a plan to increase the number of native species, to reduce water use and enhance habitat value in the park overall, or are such efforts confined to certain areas, such as the Oak Woodlands? It seems there is historic precedent for tulip trees in Golden Gate Park, according to The Trees of Golden Gate Park, including a grand, old specimen by McLaren Lodge. Tulip trees are indigenous to the eastern U.S. and were used extensively in urban parks throughout the country in the nineteenth century. As specimen trees, allowed to grow to their full glory, they are magnificent and certainly the designers of Golden Gate Park (William Hammond Hall and John McClaren, for example), recognized the value of strategically placed specimen trees, situated for maximum glory. So I guess, in terms of historical and aesthetic considerations, this tree may be defensible as a specimen tree. But I’m still bothered by its impact on the Panhandle vista. And I wonder how it fits in with sustainability guidelines for parks and open space in San Francisco? So many issues to consider when planting a new tree . . . I wish this little tree well, but it raises many questions. Tulip trees have a life expectancy of 200-250 years! I have also noticed this tulip tree. 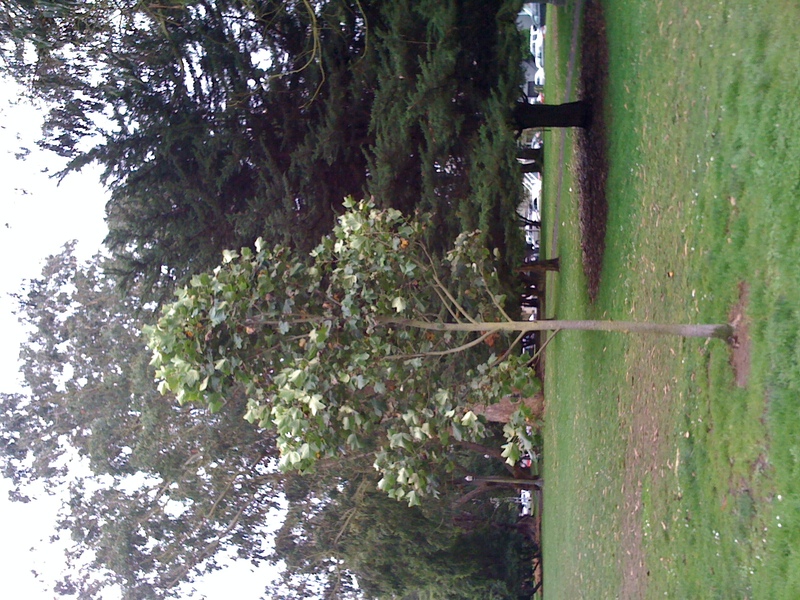 It’s not the only one recently planted in the panhandle – in fact, it seems that someone has decided to plant a number of tulip trees in the panhandle and the eastern end of Golden Gate Park. I also wonder if this is a great choice, but for different reasons. The panhandle for many years was a place for really unusual tree specimens – trees that don’t exist anywhere else in the City. It’s obvious that sometime in the distant past, someone with a real interest in plants was in charge of what went into the ground in the eastern end of Golden Gate Park. In fact, Elizabeth McClintock wrote a book about The Trees of Golden Gate Park that covered these trees. 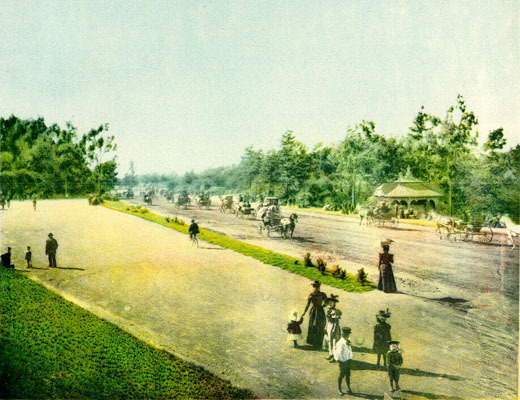 But now, when I bike or walk around this part of the park, I see only pedestrian, common – boring – trees. Trees that no one would ever write a book about. Tulip trees are great trees, don’t get me wrong – but I wish the panhandle could continue to be a “museum” of unusual trees, especially since the Arboretum is now charging fees to non-city residents.